Disclaimer: All written material here was placed for informational, educational and drawing on free-speech purposes only. Sharon Eby Cornet, nor SunStar Solutions, nor inclusions/submissions from testimonials, websites, or other data are meant to be used as expert or professional advice, and I/we are not responsible any conclusions that you arrive at on your own. Do your own research! These are the opinions of the author(s) only, based on personal experience. 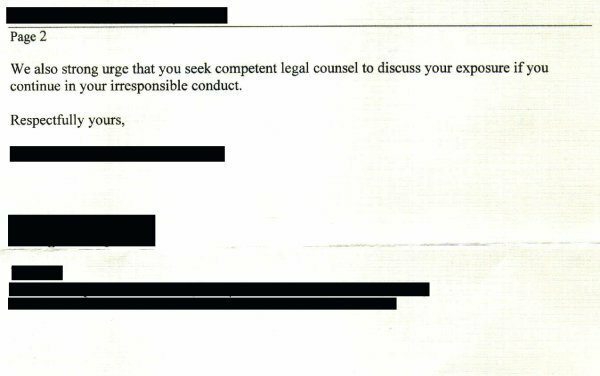 One Last Word | Letter from Attorney | Update: Letter Response from Attorney & My Response | Want to Know What Company? I REFUSE TO SELL OZONE-GENERATING GOODS TO UNSUSPECTING CUSTOMERS! As a former dealer for ******** (name withheld because of a "scare letter" from their attorney! - shown below) products I am happy to say that I no longer sell the ozone-generating air purifier units (or any of them for that matter!) to unsuspecting customers. For cleaning up the air, eliminating mold, dust, pollen, etc. these types of systems are great, but no person should be around these when they are running! This is especially true for babies (or children) whose lungs are still developing! Also, anyone with lung problems such as chronic bronchitis, asthma, etc. should NEVER set foot in a room with an air purifier that puts out ozone, nor anyone else, in my opinion. It's like the being-lashed-1,000-times-with-a-wet-noodle effect... a little here and a little there doesn't appear to bother you at first, but the constant every day use of these ozone-generating air purifiers will certainly have a dreaded and harmful (permanent!) effect on your lungs! 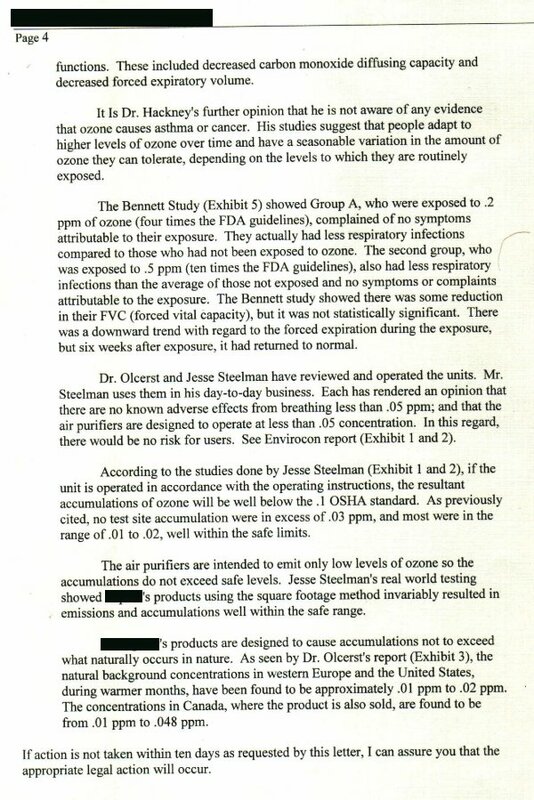 Although the amount of ozone generated is minute and considered "safe," using our air purifier was enough to cause breathing problems, dry eyes and throat, and the feeling of me not being able to get enough oxygen during the night when we would have it on (setting on the lowest possible setting in at 400 sq. ft. - but the area we were "purifying" was 600 sq. ft., 1.5 times the recommended room area!). I would wake up at night GASPING for air! Because of this only happening when the air purifier was on, I did some checking. I have since found out about the dangers of ozone when breathed (unlike the health effects it supposedly creates when in contact with water/vapor such as with the ozone created from lightning during a rainstorm, etc. - please note that water vapor is NOT present near these air purification units! For safety's sake, due to electricity being involved, nor should it be either... kind of a catch-22). The saddest thing to me was when I spoke in spring of 2003 with another potential ******** dealer (super nice lady but I will not name names even though we were both under the same person in our upline in this MLM company, ********) and she had mentioned the same thing to me, that they had a hard time breathing, thought the unit was faulty and had it replaced "just in case" only to discover that the new one caused the same effect on them (she and her husband). She told me this personally on email, and about her reservations concerning the ill-effects of the air purifiers. Unfortunately I did not think to keep her email, but to top it off, she was talked into becoming a dealer anyway (not under me) and then wound up selling these units to many customers who have no idea about the dangers of ozone! Nor do they realize the UNhealthy aspects of the positive ions (only negative ions are considered "healthy") that these air purifiers generate (4 negative ions for every 3 positive ions). To not inform customers of the truth about ozone and such... well.... In my own conscience, I simply CANNOT DO THAT! Therefore, I have chosen to not stay a dealer for ********. To choose money over people is not my style. 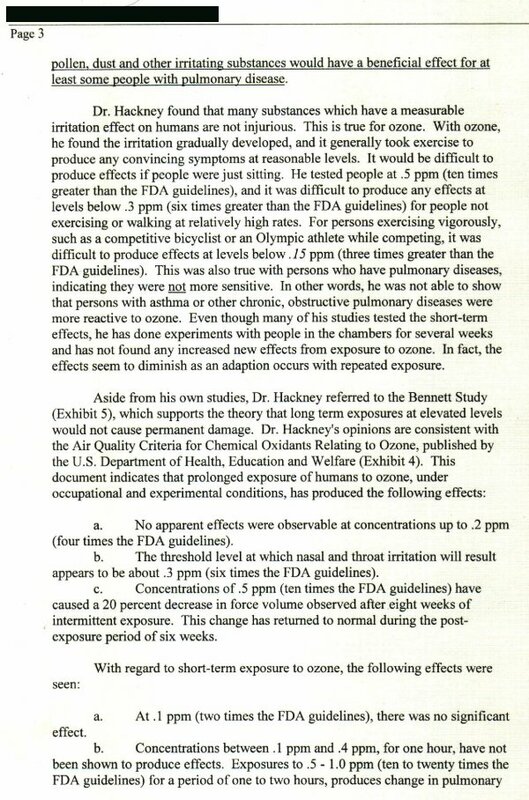 Before giving some information on ozone, I would like to give you a very real and personal testimonials from friends/colleagues of mine, including Dr. Gregory Hensley, who has been HARMED BY BREATHING OZONE (he is a scientist, mathematician and computer genius). Between myself, the ******** dealer above, and Dr. Hensley, etc. (not including others I MAY know but simply haven't asked yet to see) there are four of us just in my own small circle who have had negative reactions to ozone from water and air purification systems. How many more out there are having the same problems and not saying anything? It is only a matter of time before companies will be forced to alter their systems, or put warnings about the effects of ozone on their units, or just recall them altogether. It is, according to those "in the know", the long term use (even in small amounts) that causes irreversible damage to the lungs. Clean air. Ozone was in the air purifier I got too, and I already have lung damage - it was truly awful. I was changing the molecular sieve that we use for water filtration and cracked its housing, and accidentally opened the valve for the the ozonation part of the water filtration process. The next thing I knew I was enveloped in a cloud of ozone. I immediately experienced lacrimation and difficulty breathing. Days later this permuted into a case of pleurisy and then finally pneumonia. The ozone is directly implicated in these events. Then we purchased a ****** *** system from an independent vendor and placed it in our home after having a sewer pipe break that resulted from a fracture in the line. After exposure to that system my wife developed difficulty breathing and when we confronted the vendor we were told some big line about "toxins" in our home and the facts that we were unhealthy beforehand which was nonsense. Both events resulted in serious health concerns. Sharon, ozone is classified by the EPA as a severe pollutant. It's noxious and liable to damage mucus membranes of any person or animal near it. The fresh air is electrified air. It's been subjected to high voltage and is hyper-ionized. They make all these claims but do this, take a piece of raw meat and lay near it. Yes, it won't smell but look at the rapid and irreversible changes in the tissue. Oh, and another one, ozone is such a pollutant that anyone with asthma or breathing concerns should never go near it. Never. I'm proof of that one. I took my machine and cut it up and used the cord for another project and threw the rest away. Sharon, the body likes balance. The negative ions and positive ions all break down into free radicals and without sufficient hydration or other mechanisms of cleansing, they stay in the body and become potential cancer sites. The nasty part? These (********) are the only folks that claim ozone is healthy. Contact your public library. (Unbiased) Ask them about Hawleys Condensed Chemical Dictionary. Ask about Ozone and the threshold limiting value which determines what the potential for poisoning is for ozone. It's lower than the output of that machine in any configuration. It will tarnish silver, gold, and aluminum instantly. They say that it cleans the room and makes a fine dust because a home is "dirty". No it's electrostatic precipitation. Meaning that it is the result of a chemical reaction. Clean rooms don't use ozone. They use filtration. Clean rooms don't use ozone for anything but to sterilize water. It's a sterilant and that includes us. Ick. Sharon, always remember, with me, science is first. People pay these folks to by their products wholesale. If the FDA heard the medical claims they made they'd be incarcerated. Be careful. Gregory A. Hensley, Sc. D.
I have been good friends with Gregory Hensley for many years and remember when he told me about the "blisters in his lungs" and the great pain he suffered from the ozone damage. 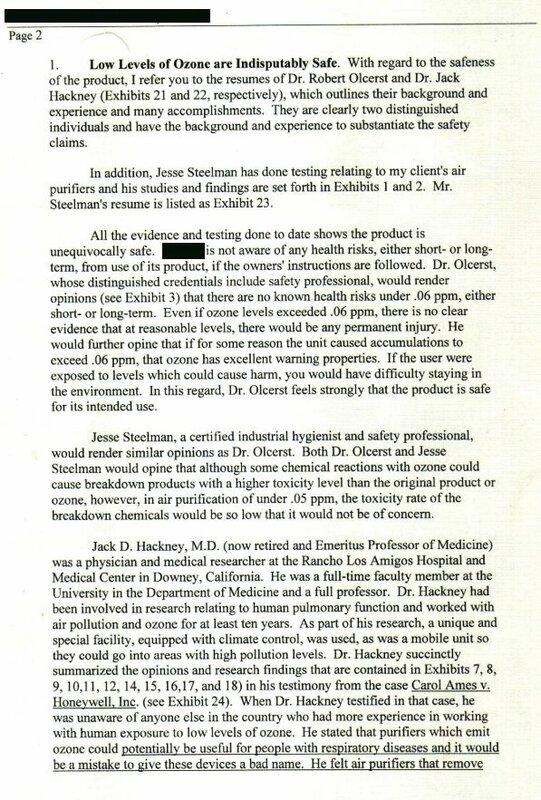 Rather than make claims on the dangers of breathing ozone I will allow the professionals and the rest of the authors of reports, etc. to do that here. BE INFORMED! Read the articles and pages below and EDUCATE YOURSELF before purchasing an air purifier that claims to generate ozone! And above all, don't take my word for this, and don't accept these few websites as the final authority.... check into it yourself FULLY before you decide what you believe! Take the advice directly from the U.S. Environmental Protection Agency (EPA)! One last word about the theory behind using NATURAL contaminants in the environment (ones like dust, pollen, etc., NOT man-made pollutants such as smog, herbicides, pesticides, crop-dusting, etc.) to help make us stronger human beings. One could argue that ozone is "natural", and it is necessary for being in the "ozone layer" up in the sky and keeping the greenhouse effect in balance around the earth, but realize that up there is where ozone belongs... NOT here where we can breathe it! I remember reading once about how to get rid of allergies by eating local honey which is laced with the pollens of local flowers, etc. so as to ingest them and build up a natural immunity over time to what normally would cause the allergic reactions in the first place. This is a form of homeopathy where like cures like. People that are stung by bees more often develop an immunity to them. Same with snake bites (provided they start out small and don't shock their system too harshly so as to kill them - I don't recommend this by the way! It is just an example.) where people who are bitten a lot develop an immunity. Not sure if it is true or not but I also read many years ago that if a child is scratched by a cat early on they develop an immunity to their dander and don't become "allergic" to cats. The list goes on and on. By joining in nature MORE we develop the immunities necessary to live a happy and productive life without fear of sneezing or coughing at every little thing. Too much of anything is not a good thing, but sometimes a little here and there can make us stronger in the end. So the saying goes... "WHAT DOESN'T KILL ME, MAKES ME STRONGER"
Resistance to our muscles makes them grow. We need to eat a little dirt as kids, to play in puddles in the rain, and to climb trees and even fall and scrape our knees sometimes. It's good for us, and it make us tolerant, not afraid of the "little hurts" in life, creates resiliency and builds character. If a seedling is grown inside of a sheltered greenhouse and is therefore protected from the elements, and then suddenly is placed outside, it will wither and die. If it is taken out a little at a time to get used to the outside air, sun, and wind and rain, then it will grow stronger and thrive! It is my personal belief that all the natural things (in normal every-day small doses/exposure) like germs and bacteria, micro-organisms and dirt, all the scraped knees and broken legs or accidents, and all the hard times we are sometimes subjected to in life in our relationships, in spiritual matters, and mental or emotional anguish, are all for a purpose to help us grow and become stronger and wiser. If it isn't "overkill" by giving more than us humans can take at once, or like the wet-noodle effect beating down upon us with no delays or mercy, then we can still say... If doesn't kill us, then it makes us stronger! Otherwise we might find ourselves as the overprotected seedlings thrown out into the world all at once, afraid of life so that we cannot handle what comes our way, and then we wither and die. 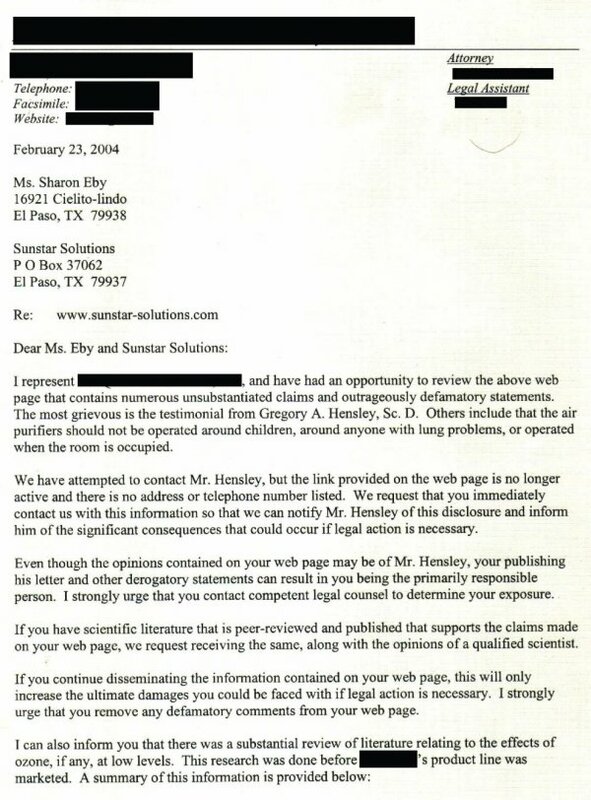 Here is an electronic copy of the "scare letter" I received telling me to remove information on my website. 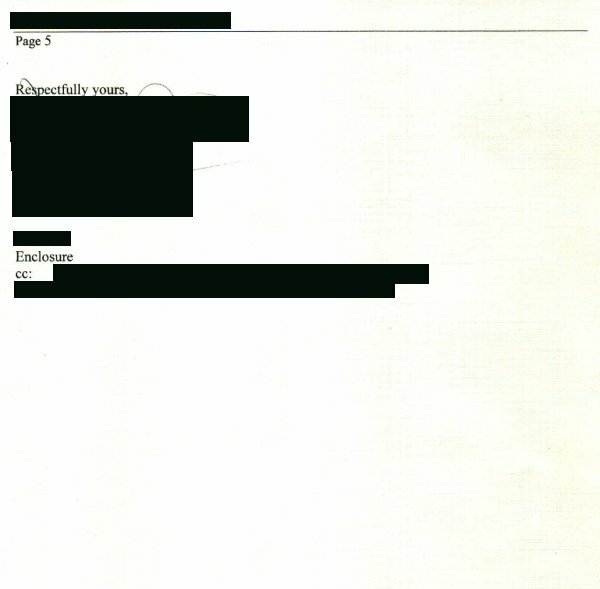 I have blacked out all names and information associated with their letter to avoid more conflict, however the rest is left intact for your reading pleasure. If you, the reader, would like to know what the name of the company is that sent this to me, and who it is that is promoting the ozone-generating air purifiers then please feel free to click here and I will gladly let you know! I'm sure a little research would also verify the name to you, on your own based on what information is provided on this webpage. Note: Due to the extensive (2/3 of a ream long) material (trying to convince me that ozone is "OK") that was sent to me by the company there was not enough room on this website to place it all so I just included the letter itself. 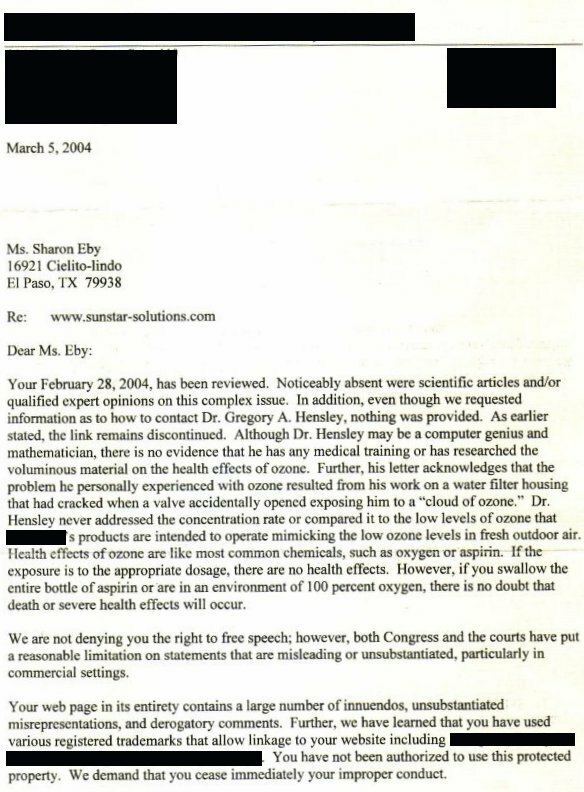 But it is obvious that they were bothered by the TRUE statements by my friend and colleague Dr. Gregory Hensley! Can't imagine why??? All names or addresses, phone numbers, fax numbers, email addresses, etc. of the company, it's associates, employees, attorneys, sellers, distributors, managers, business affiliates (minus the ones they reference for their own benefit) etc. have been removed/blacked-out in the letter. This letter is being published for educational purposes under the right to free speech. Readers... my question is... why did I personally have such troubles breathing with their ozone generating air purification unit if ozone is "safe"? I couldn't breathe in the night BECAUSE of the machine being on it's lowest setting! Others I've spoken to have had the same problem. Period! I don't even suffer from allergies either. Before I got the air purifier I breathed fine, and after I quit using it I could again breathe fine. It was ONLY while using it that I suffered effects of feeling like I couldn't get enough oxygen in the night! Let's wake up to the fact that even low levels of ozone, over a period of time (my problems showed up instantly, by the way) CAN and DO affect some people, and can and inevitably WILL cause lung and tissue damage! This is not only my opinion, but my personal belief based on personal experience and research. No amount of threats by anyone can take away my right to say so! More updates will follow as they become available.... but since I wrote that last letter I have not even heard a PEEP from them. Hhhmmm.... perhaps it was a scare tactic after all. Please keep watch in the news and in current health journals about this important topic and how these systems are now under scrutiny. Remember the wet noodle effect! Can't refute this one! Be careful folks! If you, the reader, would like to know what the name of the company is that sent this to me, and who it is that is promoting the ozone-generating air purifiers then please feel free to click here and I will gladly let you know! So much for freedom of speech eh? I believe in the protection of our rights! Much work has been done by professionals in the field of environmental and indoor air quality, etc. since I first wrote this page in 2003 -- nearly 5 yrs ago (as of this writing)! My statements above have been supported and confirmed by the scientific evidence. Ozone is now known to produce more toxins in the indoor surfaces and objects it comes in contact with, including your own skin oils, etc. Don't take my word for it... please read below by those who have done the research, extensively.